1. Naming feelings reduces the reaction of the amygdala. Naming feelings is the first step in the Connection Practice; it reduces irrational reactions in the brain. In a UCLA research study called Putting Feelings into Words, 30 participants were shown photographs of people who were emotionally upset, and then were asked to label the emotion (for example, “angry”) while the researchers measured the response of their amygdalae. The researchers found that naming the feelings in this way reduced the amygdala’s response. In a control group, the participants looked at faces and selected a name underneath them that corresponded to the person’s gender, like “Harry” or “Sally” while the researchers measured the response of their amygdalae. The researchers discovered that the amygdala – the part of the brain that sounds an alarm in time of danger – was less active when an emotion label was attached to the upset face, compared to when a name was attached. This leads us to believe that when the amygdala has been triggered, naming feelings reduces its reaction. 2. Naming needs leads to empathy. Naming needs is the second step in the Connection Practice; when we guess needs, we are trying to take the other person’s perspective, which is cognitive empathy. The Science of Empathy explains that cognitive empathy includes perspective taking, which has been shown to increase empathic concern. Empathy plays a critical interpersonal and societal role, enabling sharing of experiences, needs and desires between individuals and providing an emotional bridge that promotes pro-social behavior. This capacity requires an interplay of neural networks and enables us to perceive the emotions of others and resonate with them emotionally and cognitively, which lets us take in the perspective of others and distinguish between our own and others’ emotions. 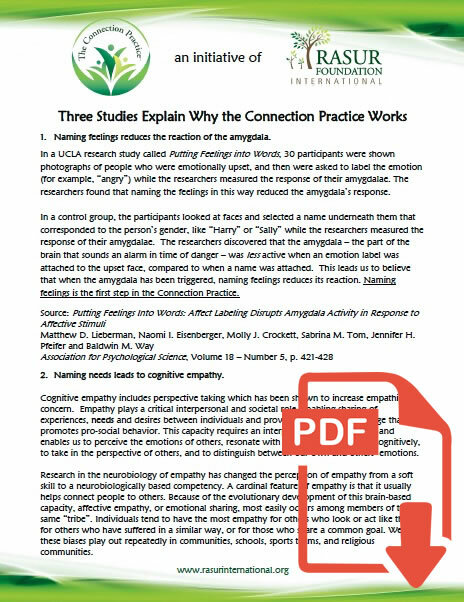 Research in the neurobiology of empathy has changed the perception of empathy from a soft skill to a neurobiologically-based competency. A cardinal feature of empathy is that it usually helps connect people to others. Because of the evolutionary development of this brain-based capacity, affective empathy, or emotional sharing, most easily occurs among members of the same “tribe”. Individuals tend to have the most empathy for others who look or act like them, for others who have suffered in a similar way, or for those who share a common goal. We see these biases play out repeatedly in communities, schools, sports teams, and religious communities. Because of this evolutionary bias, cognitive empathy must play a role when a lack of emotional empathy exists because of racial, ethnic, religious, or physical differences. Important research on empathy and altruism has demonstrated that enhancing perspective taking, the capacity to see a person’s situation from his or her point of view, coupled with enhanced value being placed on the welfare of those who are unfamiliar can override this bias. In an interesting study described in the article, Batson explored the relationship of perspective-taking to valuing a person who is in need. Perspective-taking is a well-known precursor to empathic concern. In the first experiment, both perspective-taking and valuing were variables and each increased empathic concern independently. 3. Heart-brain coherence leads to insights. Heart-brain coherence changes a person’s mood to one of positive affect, which increases access to insights. Heart-brain coherence is the last step of the Connection Practice. A Brain Mechanism for Facilitation of Insight by Positive Affect showed that people in a better mood are more likely to solve problems by insight. Research demonstrated that self-reported positive affect of participants uniquely increased insight before and during the solving of a problem, as indicated by differing brain activity patterns. People experiencing anxiety showed the opposite effect, and solved fewer problems by insight. When the steps of the Connection Practice are followed, irrational reactions are reduced, the capacity for empathy is enhanced and insights for daily living become more accessible. This has been confirmed by the personal experience of people from all walks of life who have taken the Connection Practice Foundations Courses. Here are a just a few research studies and articles written about the value of the skills taught by the Connection Practice. The Institute of HeartMath in Belgium, the Netherlands, and Luxembourg. Training also offered in Germany. Site is in Dutch, English, French, and German. The Institute of HeartMath in Mexico. Site is in Spanish. Hey Buddy!, I found this information for you: "The Science". Here is the website link: https://connectionpractice.org/connection-practice/about/empathy/the-science/. Thank you.